Today’s topic is: What sport do you wish you could try? As I mentioned in an earlier post, I played A LOT of sports as a kid. I loved just about anything that required you to keep score. It could be anything from a game of wiffle ball in the backyard to an all-nighter game-fest of trivial pursuit or god forbid monopoly. I really wanted to play baseball. In fact in the second grade I signed up to play in the Onslow County Little League and was picked for a team. We were the orange team. All the teams in the league were named a color and our uniforms were simple. Just the color and a white number on the back. That’s it. How original right? Anyhow, it was early June and we had only been practicing for a week or so and I was sitting in the little bleachers down the first base line. I was minding my own business with WAY too much Big League Chew in my mouth and suddenly one of these up and coming sluggers hit a foul ball. Everybody screamed HEAAAAAAAADDDDDDDSSS!! I was in my own little world. Not paying attention to much of anything except a moth that was fluttering by. I quickly understood why nobody likes moths—They are the zombies of the butterfly world. Anyhow, this errant foul ball hit me smack dab on top of the head and sent my flat bill orange cap flying. It was still flat-billed because I wasn’t quite cool enough to fix it right. 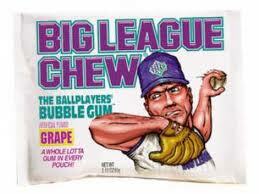 I was laid out right then and there and dang near choked to death on my wad of chew. I saw stars and blacked out a second or two. The next thing I knew I was on the ground with my feet up, a cool washcloth on my head and a group of snot-nosed 8-year olds surrounding me asking me if I was okay. Robby can’t play ball anymore. He got hit in the head. That was it. No ambulances. No trips to the hospital. No suits filed by my old man because SOMEBODY wasn’t ‘watching’ me. It was cut and dry. I took a walloped to the noggin and sent home. I even walked. It was just across the street, but still. I guess I could have played ball after I recovered but I didn’t. Why? Because by mid-June we moved away from our little house on Collis Avenue to North Carolina to live with my step-dad Mike. I doubt I would have been any good at baseball anyway. It is too much standing around. I was a football player. I wanted to hit somebody! ← NaBloPoMo: Did you have a favorite sports player as a child?